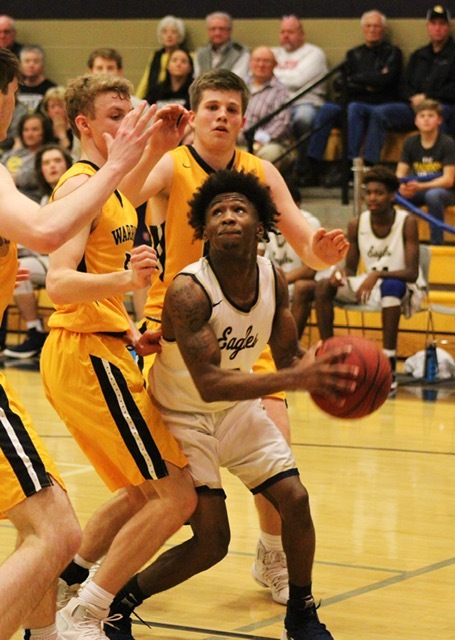 JACKSONVILLE – For the better part of three quarters in the Class 4A, Area 10 boys championship game Saturday, the Cherokee County Warriors held Jacksonville at arm’s length. But then Kyrie Maynor and Donovan McCain began imposing their wills. Maynor and McCain both scored 16 points in the second half to lift the Golden Eagles to a 73-64 victory for their first area title since 2012, 15th all-time and only their third since the Final Four year of 2004. Maynor finished with 26 points and McCain had 19 points with 16 rebounds. The 10th-ranked Warriors (21-6) made the Golden Eagles (15-11) earn their home sub-regional berth against Talladega (21-8) on Tuesday night. They jumped out to a 14-3 first-quarter lead before Jacksonville finally put things together offensively. The Golden Eagles closed out the opening quarter on a 9-2 run to trail 16-12. Cherokee County maintained the lead in the second quarter, taking a 31-25 advantage into halftime behind senior point guard Ivory Moore. Moore, who beat White Plains at the buzzer to get to this game, scored nine of his team-high 18 points in the quarter. The Warriors led 42-39 with 1:47 left in the third on a basket by Ian Edwards, but Jacksonville tied it at 42 on a 3-pointer by Omarion Adams with 1:18 remaining. The Golden Eagles took their first lead of the game on a bucket by Maynor with less than a minute remaining in the quarter and held a 47-46 lead at the end of three. Behind Maynor and McCain, Jacksonville began to pull away in the fourth quarter. They outscored Cherokee County 26-18 in the final quarter to take the win. “We got a lead early and kind of had them out of rhythm, but they kind of got into a rhythm in the second half, and once they got going, they were just pretty hard to stop,” Cherokee County coach Neal Wester said. “They’re a good team. Slade Alexander contributed 16 points, four rebounds and two assists for the Warriors, who travel to No. 7 Anniston (22-7) on Tuesday. Luke Goss collected 15 points and 15 boards. Adams added 12 points for Jacksonville. DeMarien Stewart had seven and Jay Davis had five. Shannon Fagan is sports editor of the Cherokee County Herald. CHEROKEE COUNTY (21-6) – Ivory Moore 7-15 2-3 18, Slade Alexander 7-10 2-8 16, Luke Goss 6-15 2-4 15, Ian Edwards 3-11 1-2 7, Blake Dobbs 2-2 0-0 5, Chancellor Latty 1-2 0-0 2, Nas Diamond 0-1 1-2 1, Stephen Smith 0-1 0-0 0, Bradley Elrod 0-0 0-0 0, Walton Green 0-0 0-0 0. Totals 26-57 8-19 64. JACKSONVILLE (15-11) – Kyrie Maynor 10-13 4-9 26, Donavon McCain 5-7 8-11 19, Omarion Adams 5-8 0-0 12, DeMarien Stewart 3-10 0-0 7, Jay Davis 2-8 0-0 5, Yessman Green 0-3 2-2 2, Nathan Barnwell 1-2 0-0 2, Luke Jackson 0-0 0-0 0, Carter Landers 0-0 0-0 0. Totals 26-51 14-22 73. 3-point goals: Cherokee County 4-20 (Moore 2-5, Alexander 0-3, Goss 1-5, Edwards 0-6, Dobbs 1-1); Jacksonville 7-24 (Maynor 2-3, McCain 1-2, Adams 2-5, Stewart 1-7, Davis 1-4, Green 0-3). Rebounds: Cherokee County 33 (Goss 15); Jacksonville 37 (McCain 16). Fouled out: Green. Total fouls: Cherokee County 19, Jacksonville 15. Next Story → Why not us?